Science Exchange is a collaborator in the Kakapo 125 Project. The objective of this project is to sequence the genomes of all known living kākāpō. We’re pleased to share an update on the project’s progress. NZGL has completed sequencing the second 40 individual kākāpō! The project is now past the halfway point with approximately 70 individuals remaining before we’ve successfully sequenced every individual in the entire species. 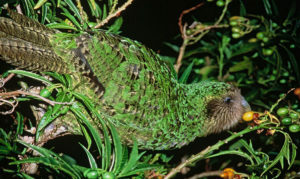 The Kakapo 125 Project has been receiving worldwide media coverage. Here’s a selection of articles published about this groundbreaking work. Sponsors of individual kākāpō genomes will shortly be receiving their custom DNA artwork. Each DNA portrait is constructed from the genetic data of the individual kākāpō and is guaranteed to be unique. Genome sponsorship forms a key component of ongoing fundraising for the project as we strive to sequence every genome in an entire species. Science Exchange is proud to be involved with this pioneering conservation initiative. Join Science Exchange today and work with us to accelerate your research.